Whether it's during the summer, the holidays, a potluck, or a weeknight...this 7-ingredient Chocolate Chia Pudding Pie requires only 10-minutes of prep, is vegan, no-bake, quick and easy, gluten-free, and refined sugar-free! In a bowl, combine the coconut milk, chia seeds, shredded coconut, maple syrup, cocoa powder, vanilla extract, and sea salt. Whisk until well combined. Mix once more, cover, and refrigerate for at least 4 hours (for best results, refrigerate overnight). Once the pudding is done, remove from the fridge, mix thoroughly once more, and evenly pour out into a round glass pie dish or single serving dishes. Cover the top completely with freshly diced mixed berries. Top with some chopped dark chocolate and/or shredded coconut. Serve immediately or keep in the fridge until ready to serve. If you made a pie, to serve, simply scoop out the pudding into bowls using a large spatula or spoon. Nutrition and serving information is for making one large round pie. This serving size is slightly smaller than if you made individual smaller servings of this pie (10 individual size servings depending on size). Measurements - For your reference, 4 tbsp = 1/4 cup. The amount of chia seeds and shredded coconut is in tablespoons because the optimal amount did not round to a convienent cup measurement. Coconut Milk - I've tried many brands of coconut milk. Trader Joe's lite coconut milk does not work well with chia pudding. I recommend using Thai Kitchen lite coconut milk. 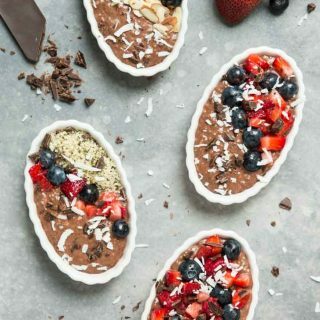 Toppings - This chia pudding tastes great topped with fresh berries, coconut, and dark chocolate. But feel free to add any toppings of choice such as hemp seeds, cocoa nibs, chopped nuts, granola, etc.